I stand corrected. And in this case, I will even sit corrected. My usual infallible judgement with regard to covers has failed me, and I have fallen hard and fast for a book I’d previously dismissed. Week after week City Dog, Country Frog remained unbrowsed on the shelves of bookstores I frequented, a few uncharitable (and unspoken) thoughts directed at the loosely painted watercolour of a dog sporting a frog on its head. 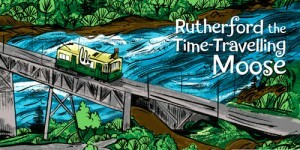 Not a fan of this style of overtly sentimental illustration. 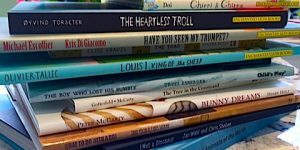 And yet…the book kept showing up in the ubiquitous year end ‘best of’ lists, and of late, as a front runner for the Caldecott medal, America’s highest honour for children’s picture book illustration. Clearly, ‘they’ were wrong, and I was right. A few days after Christmas I found myself in a bookstore, the cash faucet still dripping after a month of unbridled spending, and there they were, those watery, plaintive, puppy-dog eyes. And so, after months of resistance, I picked up the book and flipped through the pages. Oh. I get it. I’m dumb. Thus begins a friendship that spans all four seasons, painted in glorious, radiant watercolour by Jon Muth, an illustrator whose work I’ve previously profiled (briefly) in this blog. 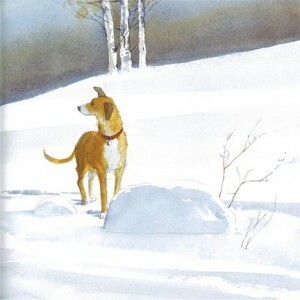 And yet, somehow in my attempts to ignore the book I failed to connect the gobsmackingly gorgeous artwork in The Christmas Magic to the cover of City Dog, Country Frog, which draws from a brighter, but equally evocative palette. Must be all the brain (and flesh) softening carbohydrates of December. of the Country Frog of spring and summer has faded. “I am a tired frog. Maybe we can play remember-ing games.” Frogs, even country frogs, have just one short life, as opposed to the seven that dogs, even city dogs, enjoy. The affable twosome spend Autumn perched together on the rock, the memories of spring and summer so bright and vivid the images manifest in the clouds. 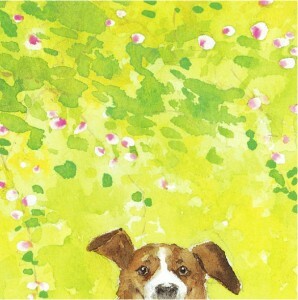 When City Dog returns in the winter, Country Frog is nowhere to be found. City dog waits. And waits. And then spring arrives again. City Dog runs thr0ugh the field and finds a chipmunk sitting on Country Frog’s rock. “What are you doing? asked Country Chipmunk. It’s a good thing I didn’t finish the book in the store, because I was a sobbing mess the first time I read it all the way through. 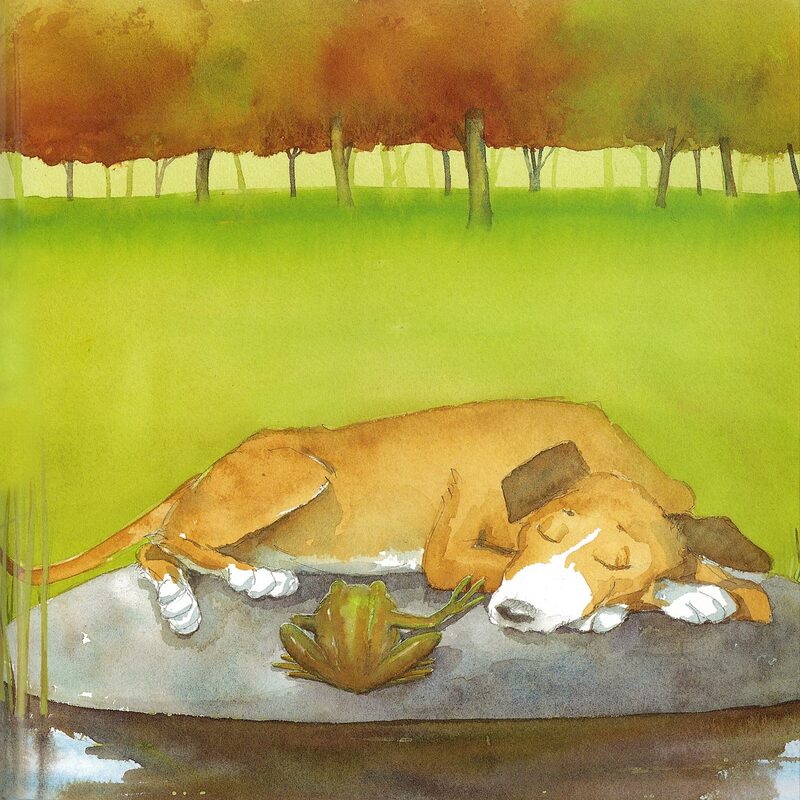 Yes, City Dog, Country Frog has something to say about life, and death, but is says it sweetly, without any fuss and with a huge amount of charm, thanks to a few, well chosen words by Mo Willems and the luminescent watercolours by Jon Muth. In previous books such as Three Questions, Zen Shorts, and most recently Zen Ghosts, Muth has narratively and visually expressed the Japanese philosophy he espouses. 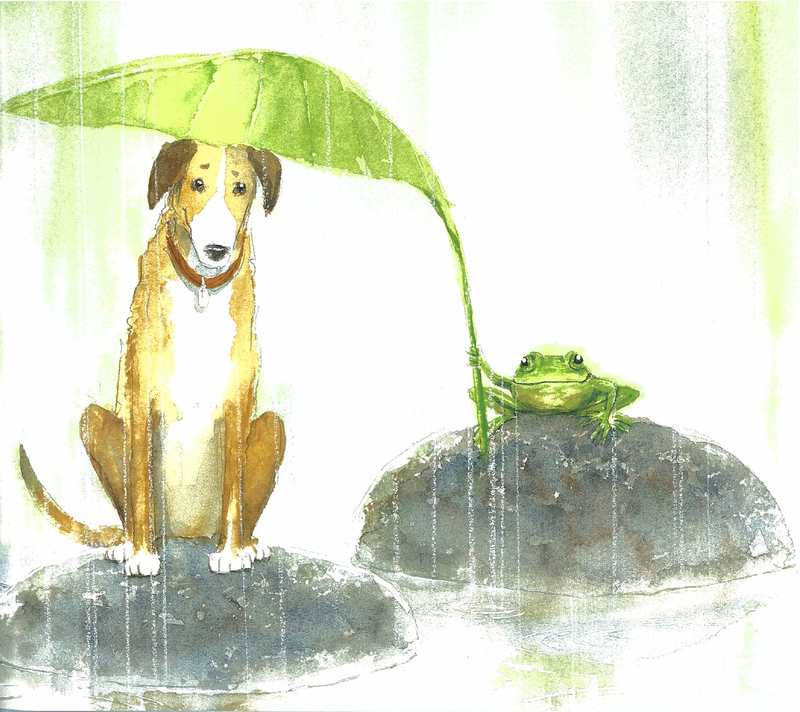 While City Dog, Country Frog veers away from Panda-based Zen masters, the illustrations retain a gentle sort of expansiveness that is both stirring and calming, like an exhaled breath. Each turn of the page is another goofy, sweet-faced creature, or a jeweled landscape, pulling me out of a case of the winter blues I didn’t even know I was suffering from until I experienced the before and after. Even Muth’s winterscapes, full of actual blues (and purples), are an expression of peace at a tricky moment where the story takes a sudden, melancholic turn as City Dog searches for Country Frog in the snow. 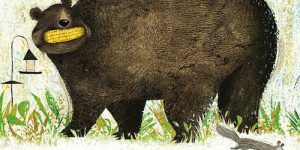 The bright canvas of City Dog, Country Frog not only adds to the narrative, it also deepens the emotional impact of the words. 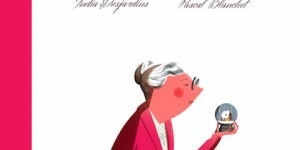 The result is a simply told, but honest and ultimately uplifting reflection of the seasons of life: the joys, the sorrows, and especially, the unlikely friendships. Jon Muth studied painting and printmaking in various international cities, as well as England, calligraphy and stone sculpture in Japan. 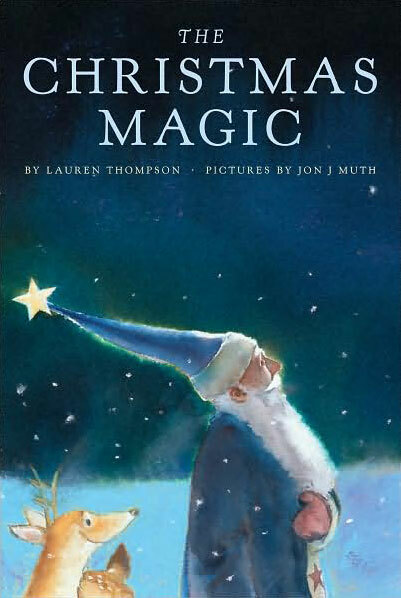 Initially revered as a comic book artist, working with Neil Gaiman (among others), Muth’s switch to children’s picture book illustration (and writing) has won him many new fans, and numerous awards, including a Caldecott Honor for Zen Shorts. In reading a few Muth’s interviews online, I was particularly amused by this comment: “I’ve never won an argument with a watercolor.” A very keen observation of this persnickety medium, but by all appearances, Muth has elevated this so-called argument to a level of amiable conversation. 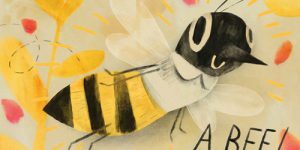 Hopefully, next week, City Dog, Country Frog will receive the recognition it deserves from the fine folks at the Caldecott collective. The multi-talented Mo Willems is a former Emmy award-winning writer for Sesame Street who was won much acclaim for his many children’s picture books, including Knuffle Bunny and Don’t Let the Pigeon Drive the Bus. (I must state that while the Pigeon’s driving skills are questionable, he is an amusing and skilled Tweeter.) 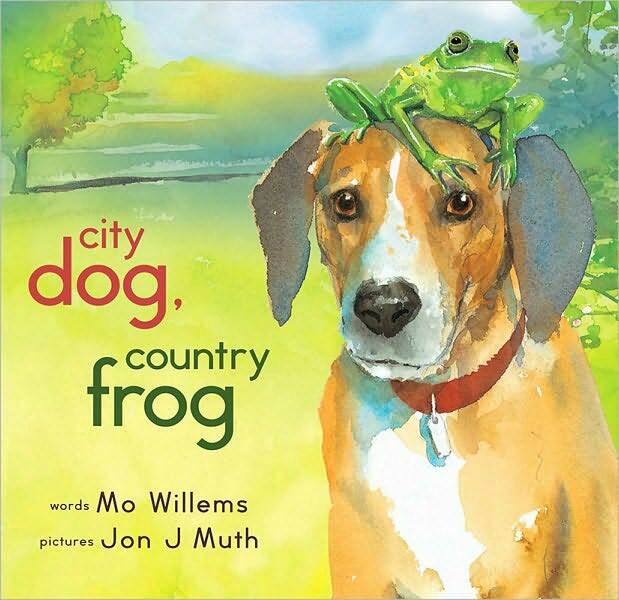 City Dog, Country Frog is based on Willems own dog, Nelson, a fellow outdoor adventurist who may or may not have befriended a frog, but who is clearly a friend to the author, as evidenced in this video about the making of this wonderful story. 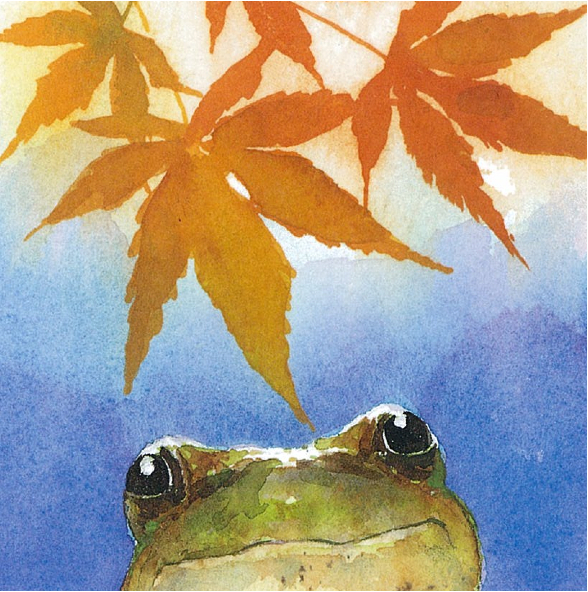 As for my initial disregard for the book, in my defense, weak though it may be, many of the illustrations inside City Dog, Country Frog are lovelier, and more engaging than the one chosen for the cover. Maybe. Perhaps. I don’t know anymore. I am now officially smitten with the entire book, including the cover. 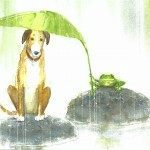 3 Comments for "A Dog, A Frog, and an Apology"
oh.. your review has brought tears to my eyes. I have to say I wouldn’t have picked up this book (for the simple and very dull reasons – because I’m not a dog fan) but now I really want to read it. It’s always lovely/strange/slightly sad for me when there’s a book with a lot of hype and for some reason I don’t think it’s for me so I avoid it and then when I finally do pick it up and fall in love with it. I was skeptical of this book at first too, but I can’t resist Mo Willems, so I had to pick it up. I was so moved that I asked for it for Christmas. It is just beautiful! Well said. 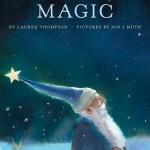 I thought I wouldn’t like the book either… I’m more of an Edward Gorey/Lynd Ward fan. I thought it would be predictable cheez. And while the story has been told before (they all have, right?) “City Dog” does it in a great, simple way. 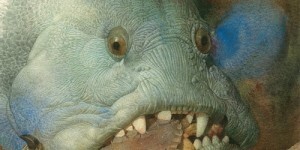 As an aside, your image labeled “Portrait of a Frog as an Old Man” had me laughing.